Recently, I stayed in Manila for one night on the way to Napantao where I was going to take part in a coral reef conservation project. I was fascinated by the ubiquitous jeepneys, a cross between a jeep and a bus, the main mode of public transport in the Philippines. 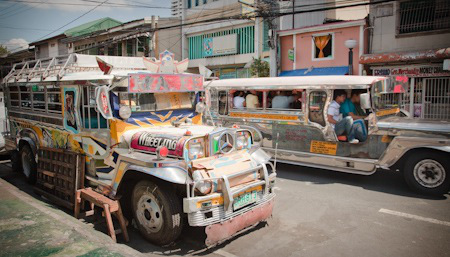 The first jeepneys were modified army jeeps left behind by the Americans after WWII. They have been customized by the Filipinos with bits of chrome, religious iconography,cartoon characters from comic books, coloured headlights and adverts. They are now made locally from aluminium and steel but remain faithful to the original design. Often bursting with passengers, crammed in like sardines in a can, they are a cheap way to get around but you can’t see much through the narrow windows.